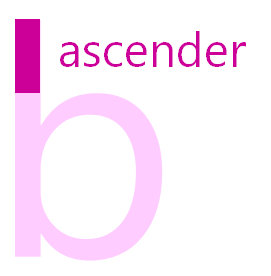 Ascenders are the parts of a lowercase letter that reach upwards, the parts that extend above the typeface’s x-height. 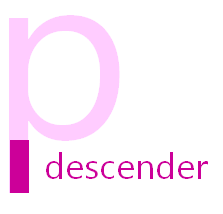 You can see ascenders in letters such as: b d f h k.
Descenders are the parts of lowercase letters that hang downwards, the parts that extend down below the baseline. You can see descenders in letters such as: g j p q y. This article is the part of the Anatomy of Type series. To learn more about more about typography, design principals, and colour check out my Pluralsight Introduction to Design course.